Prof Veena Srinivasan has been appointed as the holder of the Prince Claus Chair in Development and Equity 2018-2020 at Utrecht University. 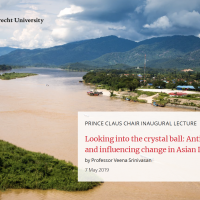 On 7 May she will deliver her inaugural lecture, entitled: ‘Looking into the crystal ball: Anticipating and influencing change in Asian deltas’. Srinivasan has been appointed to the Chair for her research into sustainable and inclusive food production in Asian delta regions. She is keen not only to contribute to delta and food research being conducted in Utrecht, but also to play a role in intensifying collaborations between Dutch and Indian institutions. She will engage in comparative research across delta regions within India (Ganges and Cauvery) and across Asia (Mekong and Indonesia). Date: 7th May 2019, 16:15 – 18:15. Location: University Hall (Academiegebouw), Domplein 29, Utrecht.